Hey! Hope everyone is enjoying fall as much as I am – although here in NYC if you're standing in the sun, it still feels like Summer. I'm sure all New Yorkers know what I mean. Soon enough we'll be wearing boots, scarves, hats – is your Fall wardrobe ready yet? Speaking of hats, DID YOU KNOW that not everyone feels comfortable wearing hats?? In fact, I used to be one of 'those people. I'd feel totally self-conscious & think "does this hat look good on me?" or the other question, "is everyone going to be staring at me?" - anyone else felt that way?? However, these days I'm much more confident when I wear a hat - well, actually it depends on the hat. 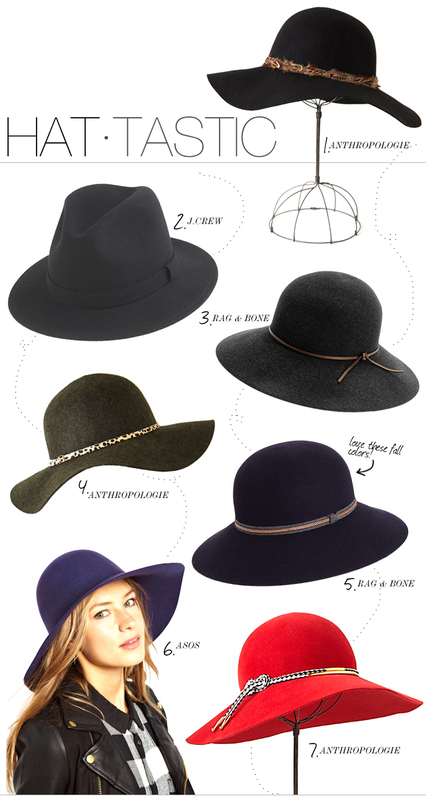 I rounded up a few ready-for-Fall styles, but my fave is the #5 Rag & Bone Dunaway Hat. Classy all the way. How do you feel about hats? self-conscious? or completely confident? I am absolutely a hat person but live in a place where I would be so out of place. I love going to northern states so I can pull out all my fun hats. I wish I could pull off hats like these! I just started with fedoras this summer, so maybe I can try to transition into fall... they's so cute! I've always loved hats but I only own a fedora! That grey Rag & Bone owns my soul, though. Mmmm. Yes please! Yeah, I haven't come around to hats quite yet-I don't feel like they ever look good on me, but I guess I just haven't found the right one. They would great for sun protection, which I definitely need! especially like the j.crew hat!